Now shipping. 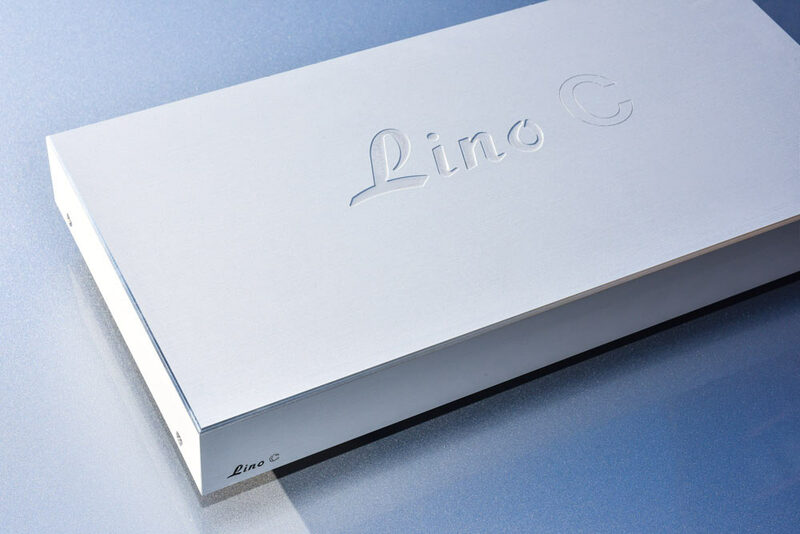 The current mode (transimpedance input) Lino C 2.0. Balanced inputs / balanced and unbalanced outputs, low noise AGM rechargeable battery power supply, precision (+/- 0.1 dB) RIAA EQ, all for $2499. Brushed aluminum or optional (special order) powder coated gloss black chassis. Contact Channel D for ordering information. 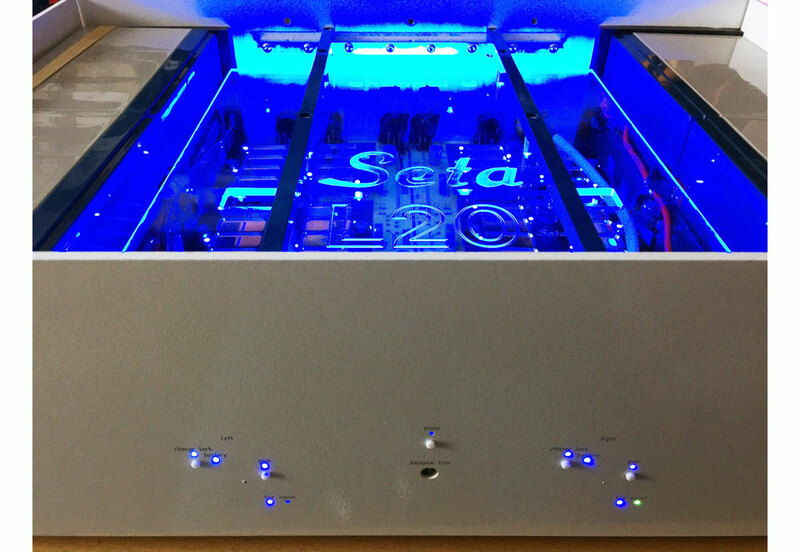 Our flagship - the Seta® L20. Now introducing the L20 mk2. 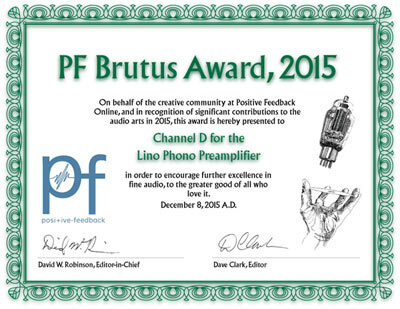 Read more about this revolutionary phono preamplifier here. Customer comments on our Seta Model L: "I've evaluated the RIAA out and compared to my Aesthetix Rhea Signature phono amp. I have to tell you that I'm amazed at how good the Seta L RIAA circuit is. Fantastic resolution and bandwidth plus depth. 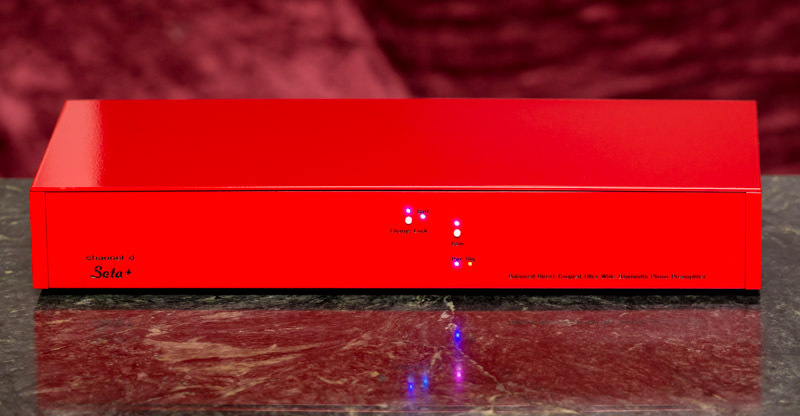 I've already sold my Aesthetix Rhea Signature phono amp - your Seta L rendered it redundant! If I'd known how good the Seta was I would have purchased long before now but then, you only know what you know. By occupation, I'm a professional aerospace engineer so I like technical challenge too. I take my hat off to you and wonder how you have found the time to design such amazing hardware and software products. If you were a Brit over here, I'm sure you would have won a Queen's award for innovation by now. Keep up the good work! " Seta phono preamplifiers offer a fully balanced (from input to output), low-noise direct coupled (DC) differential circuit design providing the users of Pure Vinyl™software with the end-to-end route to the superb performance of "flat" vinyl reproduction (linear amplification followed by software RIAA correction). 1. The preamplifer "Flat" outputs have 12 dB lower gain, taking advantage of the emphasized treble in the non-RIAA-compensated signal. 2. The Flat outputs are intended for use with Pure Vinyl software RIAA compensation. 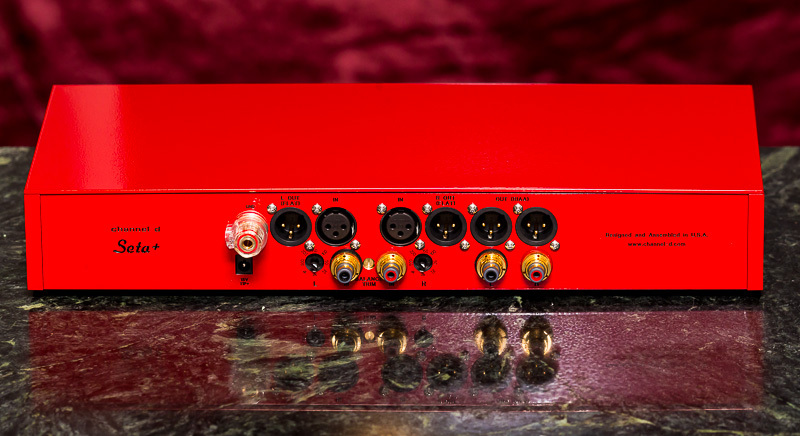 The RIAA outputs function the same as a conventional stand alone phono preamplifier. 3. Flat outputs using a test signal generator having a 5 ohm or lower output impedance (Thevenin equivalent impedance) typical of a low output moving-coil cartridge. The frequency response of the Lino and Seta Piccola models will be greater at lower than maximum gain settings. For example, twice the specified bandwidth at 6 dB lower than the maximum gain setting. 4. The preamplifier prices include standard phono preamplifier RIAA outputs. Price would be lower by this amount if the preamplifier is ordered with "Flat" outputs only. Listening evaluations using a variety of reference systems and program material show that an important key to accurate reproduction of vinyl audio involves greatly increasing the signal bandwidth of the preamplifier front end (the first stage of amplification touching the signal from the phono cartridge). Why? First of all, high quality phono cartridges are capable of reproducing signals well over two octaves above the audio frequency range. While such signals are inaudible, the preamplifier also must work to amplify these signals, which are boosted over 20 dB above midrange levels (because of the standard vinyl treble pre-emphasis curve used in the mastering process). A preamplifier unable to handle out of band signals will distort in the ultrasonic region. This distortion will carry over into the audio range, affecting the reproduction of the midrange and treble. The rule of thumb for linear signal reproduction is ten times (an order of magnitude) greater than the signal of interest. With that criterion, the amplifier is able to linearly reproduce out of band signals, while preserving the integrity of the midrange and treble without the "haze" caused by, and characteristic of, ultrasonic intermodulation distortion. Going still further, extending the bandwidth by two orders of magnitude delivers a stunning improvement in three-dimensionality and imaging. This principle is continued by the Seta L20, which has a signal bandwidth three orders of magnitude (1000 times) that of audible frequencies. 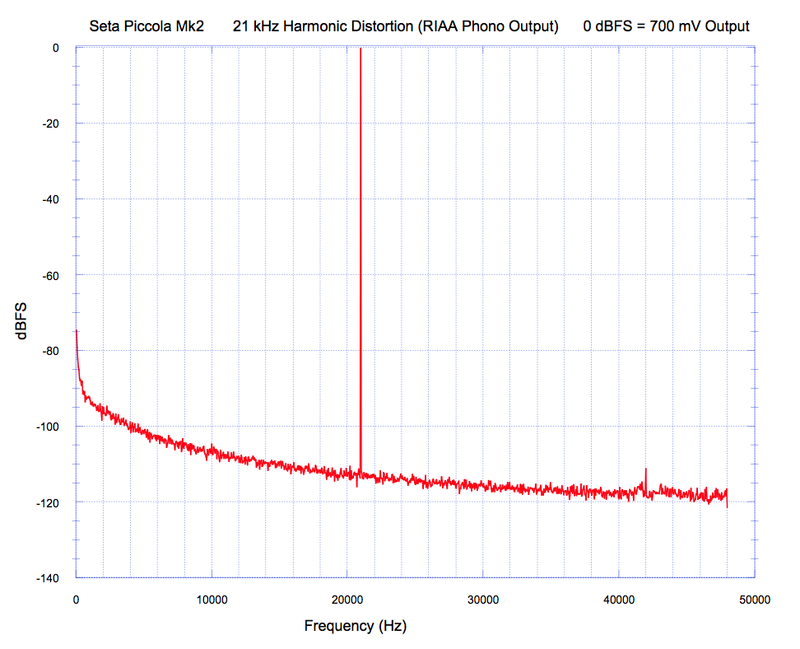 Why don't more phono stages have ultra wide (megahertz) bandwidth? Why do some line stage preamplifiers have megahertz bandwidth? 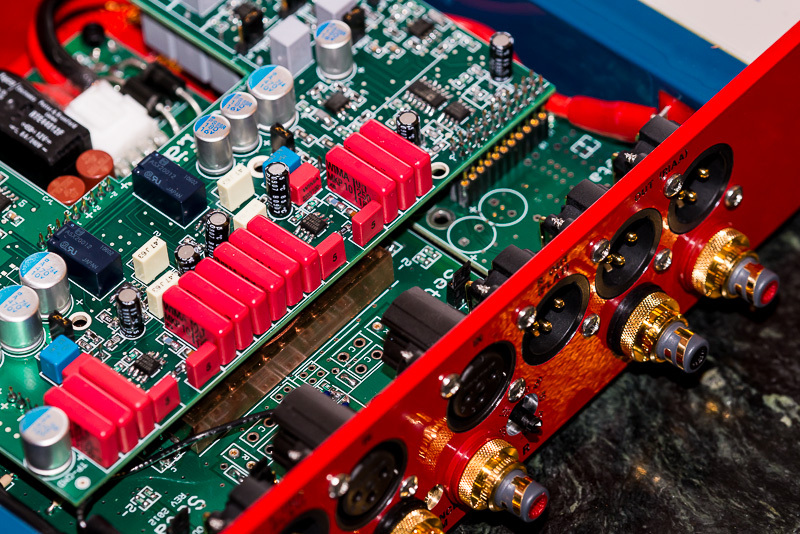 It's one thing to design a line stage preamplifier, and quite another to design a phono stage. The difference is the extreme amount of gain required in a phono stage - around 100 times (40 dB) greater than a typical line stage. A trade off exists between gain, signal bandwidth, noise and distortion. In most phono stages, the required high gain means that the other design parameters must be engineered more conservatively. This was the case until the introduction of our 5 megahertz bandwidth Seta Model L in 2007. The lower gain required for a line stage makes it easier to design with wide bandwidth. For instance, our special-purpose Buffer Amplifier products, introduced in 2012, are essentially simplified line stages - and have a 20 megahertz bandwidth - without resorting to the new (and much more expensive to implement) design methodologies employed in our 20 megahertz bandwidth Seta L20. To dispel misinformation which we've seen on the Internet and in print advertising: surface mount components provide the shortest signal paths and highly optimized circuit layouts, with low stray inductance, low stray capacitance, low temperature coefficients, high stability, improved unit to unit consistency and consequently better performance than old-fashioned through-hole circuit components. Surface mount manufacturing is not strictly the outcome of short-sighted "value engineering" - it is the result of the never-ending quest for increased performance of electronic components and circuits; lower manufacturing costs are a welcome side effect. There are cheap surface mount components just as there are cheap through-hole components, both of which deliver inferior performance. However, the performance of all through-hole parts are eclipsed by the best surface mount components, as used in our preamplifiers. Further, certain types of high-performance circuits simply cannot be created with through-hole components, especially those requiring ultra wide bandwidth. There is one specific exception where through-hole parts deliver better performance: high performance film capacitors. The solid organic polymer dielectric used in all high performance film capacitors cannot withstand the high temperatures encountered during surface mount manufacturing. In response, alternative high-temperature-compatible organic polymer dielectrics have been introduced, such as polyphenylene sulfide (PPS). We have evaluated these parts and have found them markedly inferior to other film capacitors, such as the metallized polypropylene type that we use for RIAA and filtering circuits. PPS has poor thermal stability, making it impossible to hand select PPS components for precision tuned circuits, because the values of PPS capacitors change too much when exposed to the heat from soldering. They also have inferior dielectric absorption and dissipation factor (causing a loss of definition and veiling) and DC leakage compared to metallized polypropylene - we have measured the DC leakage changing substantially depending on the atmospheric humidity! They are also not available in higher values, leading to less than optimal circuit designs (even if they otherwise matched the performance of other polymer film capacitors). Accordlngly, surface mount film capacitors (and only surface-mount film capacitors) are ill-suited to high performance audio. Of course, as any electrical engineer who has worked with practical circuits knows, high performance through-hole film capacitors (partly because of being large-sized, through-hole type parts, but also because the permittivity of the dielectric material used decreases with frequency) cannot be used for critical (and essential) high frequency power supply bypassing - they become inductive at relatively low (several hundred kHz) frequencies. This is where MLCCs (multilayer inorganic dielectric capacitors - we'll use the "dirty word" here - ceramic; but rest assured that today's 21st century ceramic capacitors use exotic materials such as zirconium tin titanate / C0G and barium titanate / X7R that are definitely not "your father's ceramic capacitor") really shine, because of having exceptionally low inductance (and ESR, equivalent series resistance). This is a direct consequence of their miniaturized size, internally having hundreds of layers of electrodes separated by dielectric - an amazing feat of manufacturing achieved only in the last several years. On the other hand, inorganic dielectrics are definitely unsuitable for use directly within the audio signal path because of dielectric absorption, higher dissipation and their generally wider capacitance tolerance (tight tolerance is needed for precision filter circuits such as rumble filters or RIAA EQ), plus susceptibility to microphony (because the X7R dielectric used in the lowest inductance parts exhibits piezoelectric activity). However, these drawbacks are unimportant considerations for power supply bypassing, where low ESR, low inductance and small size are of paramount importance. 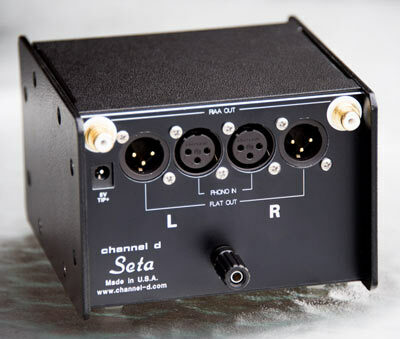 Seta Model L / H preamplifier's hybrid, video - bandwidth amplifier modules are electronically and acoustically isolated and kept at a stable operating temperature and environment (constant humidity) by enclosing and sealing them in a block machined from a solid piece of oxygen-free high conductivity copper. 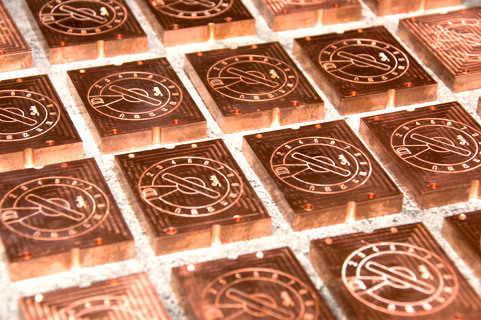 Each module is carefully tested and characterized before and after being hermetically sealed in the copper block. 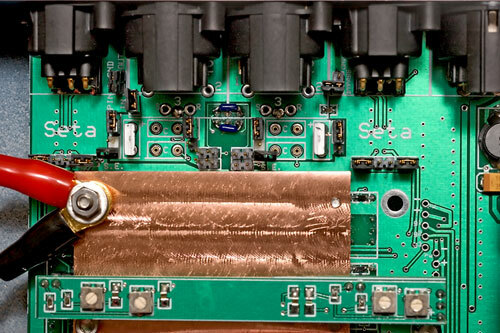 Seta preamplifiers, besides (or should we say, despite?) providing the widest bandwidth of any phono preamplifiers available, also feature low noise that ranks among or better than the world's finest phono stages. 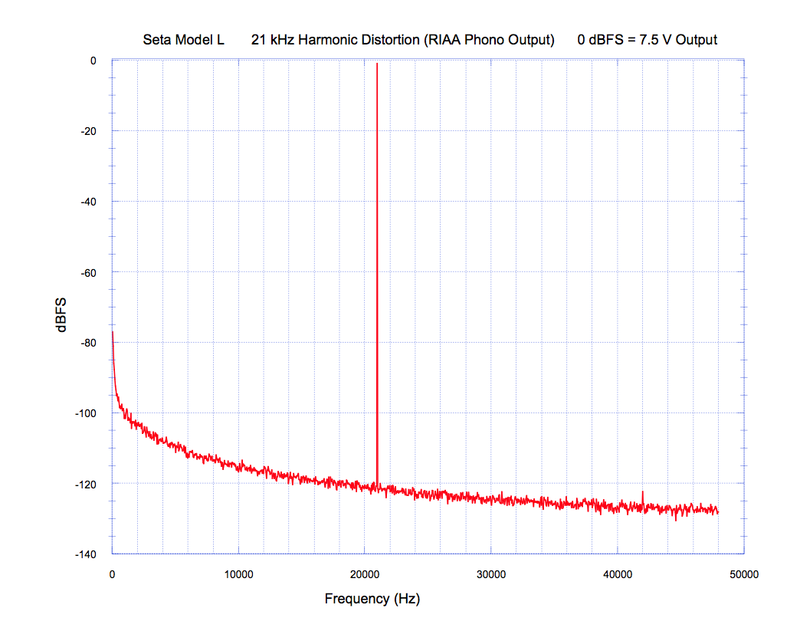 Here is a comparison of measurements performed by Stereophile (including issue dates for verification) of the signal to noise ratio (SNR) of moving coil phono preamplifiers, including our Seta Model L. Higher numbers are better. The quietest are highlighted in boldface. *The signal to noise ratio has been improved in the year 2015 and later production by approximately 4 dB from the numbers shown above obtained from the August 2010 Stereophile review, and are reflected in our current published specifications, e.g., 71 dB A-Weighted SNR for the Seta Model L.
Measurements of distortion levels, bandwidth and RIAA accuracy are best gleaned from reading the associated reviews, but the Seta Model L ranks near the top, if not at the top of the list in this regard. For further confirmation, see John Atkinson's follow up review of the Model L (December 2013 Stereophile, download here) with additional highly favorable distortion and RIAA accuracy measurements. Note: In that report, John also made another measurement of the signal to noise ratio, but unfortunately had the Seta configured for single ended rather than balanced mode, resulting in diminished performance in the noise measurement! Seta Plus (available in natural anodized aluminum, or gorgeous red powder coat finish, as shown). Includes heavy, milled aluminum chassis and lower impedance battery power supply. The Seta front end circuitry is tailored to preserve the strengths of the characteristics of different cartridge types. A low noise, high impedance FET front-end is used in the Seta Model H for moving-magnet and other high output cartridges, while an ultra-fast, ultra low noise bipolar transistor front end is used in the Seta Model L for low impedance, low output moving coil cartridges. The circuit topology is fully differential, balanced direct-coupled circuitry from input to output. 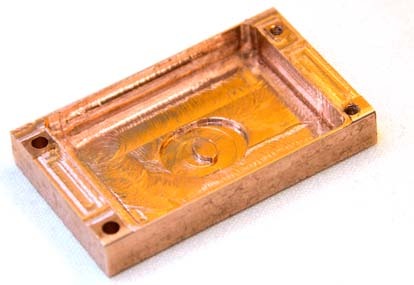 The front-end active circuitry is surrounded on five sides by a sub-enclosure machined from a solid block of copper. This provides electronic and acoustical noise isolation plus thermal stabilization. Bare copper metal surfaces are coated with a clear lacquer to prevent oxidation (and to maintain their beautiful color). 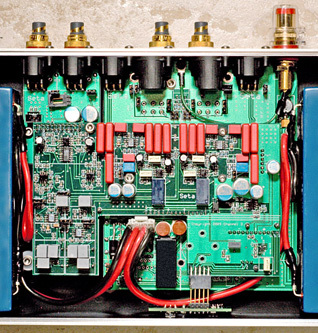 Unlike many other preamplifier designs: the rated (-3 dB) bandwidth is independent of gain. 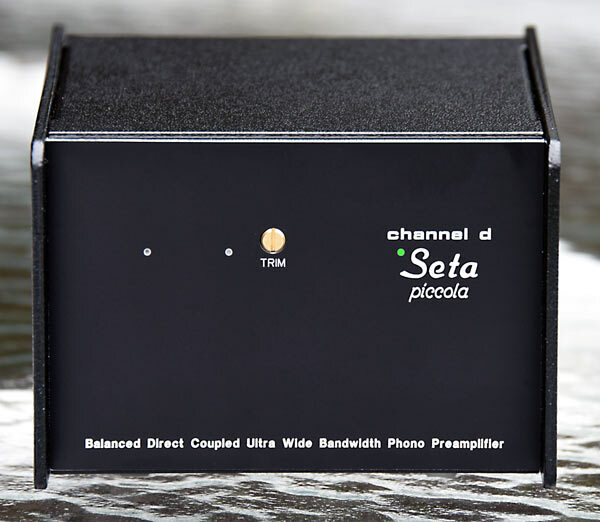 The Seta Piccola phono stage uses carefully selected, ultra low distortion, low noise ICs also in a fully balanced configuration with a bandwidth of 1 MHz (-3 dB). All Seta products use 0.1 percent tolerance precision low noise metal film resistors in all critical areas. The low-impedance, internally located AGM rechargeable battery is capable of supplying 50 amperes of current, outperforming other types of batteries used in audio applications. The battery is conditioned and kept float-charged by a proprietary, uniquely designed rail balancing circuit, rather than use an "off the shelf" microprocessor based conditioning and monitoring circuit, which would introduce unwanted noise. 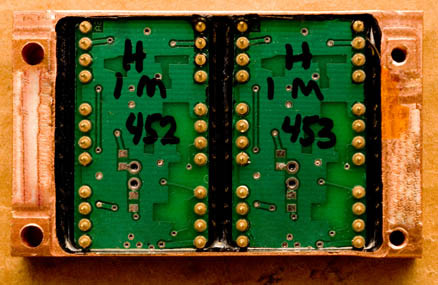 Locating the battery inside the preamplifier chassis also insures that the battery is in the same electrical environment as the sensitive front-end circuitry, eliminating potential sources of noise pickup. The external charging supply is automatically disconnected when an input signal is detected. All connectors are the best available, professional quality Neutrik gold contact XLR and WBT gold contact helical conductor wide bandwidth RCA (Model L / H). Pushbutton actuated, sealed gold contact small signal relays are used to change gain settings (four different gain settings, Seta Model L / H). A unique rear-panel rotary balance trim control with a precision 2 dB range provides for fine cartridge channel balancing (the trim setting is not affected by the overall gain). Of course, the "last word" in the evaluation of audio products should be done by using the best "measurement:" real-world, listening-based evaluation. However, we believe that careful measurements also are essential, if only to insure that the product you receive actually conforms to the designer's original vision and intent. Model L - Fully Balanced, Ultra Wide Bandwidth 5 MHz "Flat" Phono Preamplifier for Low Output / Low Impedance Moving Coil Cartridges; Low Impedance, Low Current-Noise Hybrid Bipolar Input; High Performance, Low Noise Internal AGM Battery Power Supply. Seta Model H / L front; Model L rear view. Fully Balanced, Ultra Wide Bandwidth 1 MHz "Flat" Phono Preamplifier for Moving Magnet and Low Output Moving Coil Cartridges; High Performance, Low Noise Internal AGM Battery Power Supply. RIAA RCA Outputs. *Note about Gain specifications: If you're accustomed to using conventional phonograph preamplifiers, the available Seta gain settings may seem somewhat lower than usual. However, they are tailored to using the Seta with Channel D Pure Vinyl's digital vinyl compensation curve. The required gain is about 10 to 12 dB less than needed in a conventional phono preamplifier, because the signal is provided to Pure Vinyl with treble emphasis (boost) intact. (For the technically knowledgeable: this turns out to be somewhat less than the maximum 20 dB correction of the RIAA compensation curve at 20 kHz, due to the frequency balance of most music.) For example, if you would normally use a preamplifier gain of 38 dB for a moving-magnet cartridge, then the proper setting on the Seta would be 26 dB. Likewise, the RIAA hardware compensation module provides an additional 12 dB of gain (at 1 kHz). 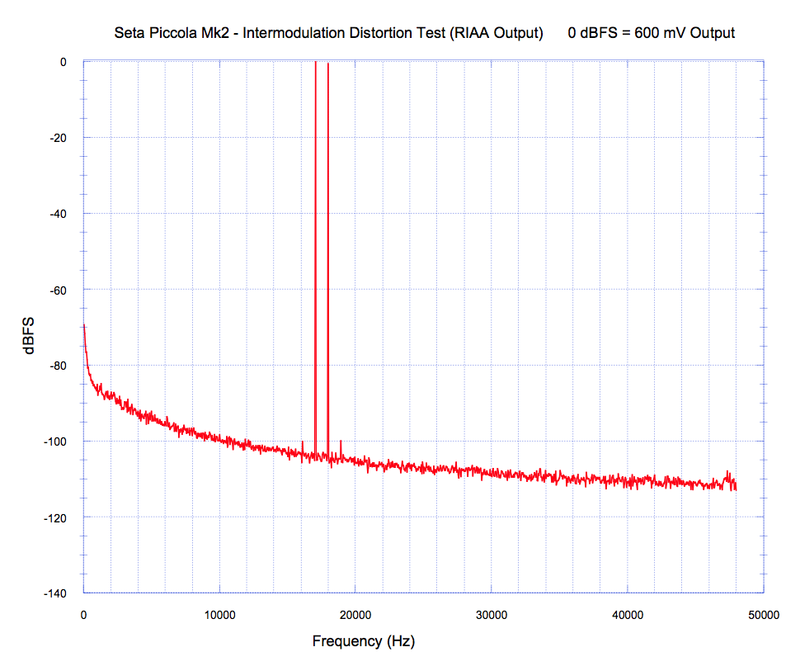 Seta RIAA Internal Correction: Included Internal Hardware RIAA Correction for Seta L20, Seta Model L, Seta Model H, Seta Piccola, Lino. Includes Balanced (Neutrik Gold Pin XLR) and Single Ended (WBT Nexgen Helical Contact RCA) RIAA Phono Outputs (L20, Model L / H; Seta Piccola uses high quality gold-plated chassis mount RCA connectors and is internally single-ended; Lino RIAA outputs are selectable Balanced or RCA). Can be used simultaneously with the Flat outputs, for independent all-analog monitoring/listening plus Flat output to external digital converter. 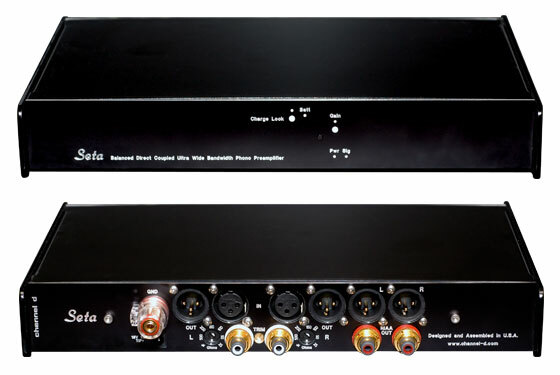 Internal RIAA Compensation Module, shown installed in Seta Model L.
"[The Seta Model L] is a quiet, remarkably neutral-sounding, extremely well-built phono preamplifier... [the Seta with Pure Vinyl's digital RIAA] was fundamentally accurate in terms of tonality and space, and its low- level resolution was remarkable." "A very linear circuit? 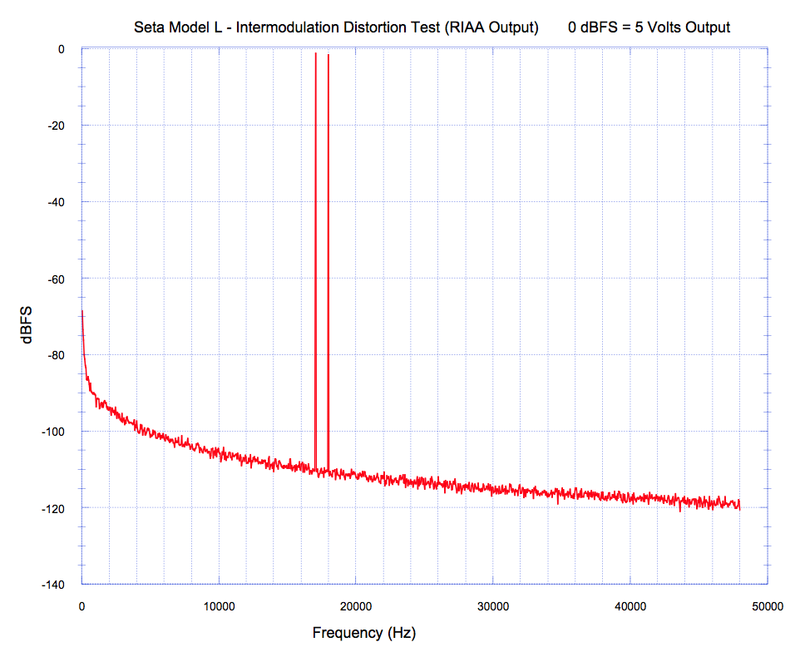 [no intermodulation products in] the spectrum of the [Seta Model L's] flat output... no distortion harmonics can be seen above the noise floor, even when the load impedance is reduced to a punishing 600 ohms!" Copyright © 1996 - 2017 Channel D, All Rights Reserved. Seta is a registered trademark of Channel D.